Prospects are visitors to your site that have not yet converted on a form. The prospects tool uses the HubSpot tracking code to detect the IP address for each page view. It then surfaces publicly available information about the associated company so you can learn more about the visitors to your site. Please note: visits from IP addresses that you exclude from analytics will still be tracked by the prospects tool. Small companies and individuals may not have their own IP addresses. In those cases, the prospect will appear as the internet service provider (Comcast, Cox, Verizon, etc.). 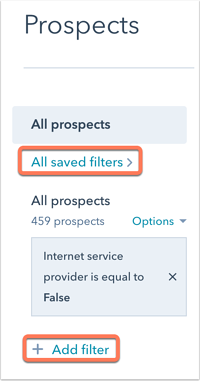 By default, the prospects tool will filter these prospects out using the Internet service provider | is equal to | false filter. You can remove this by clicking the x on the filter. In the upper right, click the Actions dropdown menu, then select View tracking code. Add the code to your site. Once the tracking code is added, prospects will appear in the prospects tool as they visit your site. 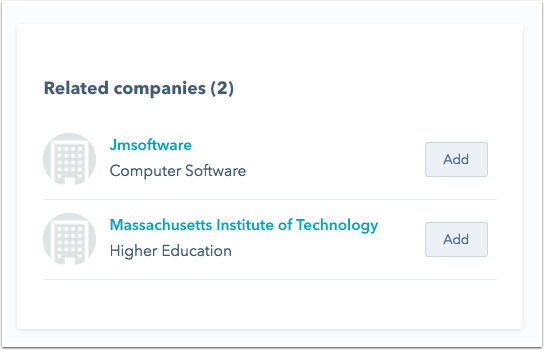 To segment your prospects, create filters or use the search bar to search for prospects by keywords, such as state or country. To hide a prospect, select the checkbox next to the prospect, then click Hide. Hidden prospects will not appear in the daily email. To favorite a prospect, click the star icon favorite next to the prospect. 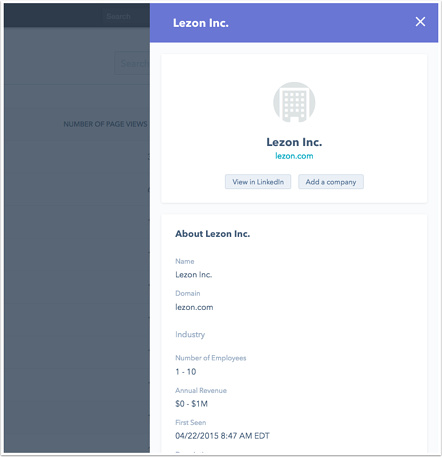 To add a prospect as a company record in your database, click the plus icon + to the right of the company name. You can also add multiple prospects at once by selecting the checkboxes to the left and clicking + Add to database. To customize the columns in the prospects tool, in the upper right, click the Actions dropdown menu, then select Edit columns. In the dialog box, select the checkboxes next to the properties you want to include in your prospects tool, then click Save. To see additional details about a prospect, click the company name. To access the company's LinkedIn profile, click View in LinkedIn. To create a record for this company, click Add a company. To open the company's website in another tab, in the Domain field, click the external link icon externalLink. To see similar companies in the industry, scroll to the Related companies section. Click a company name to access the company's website. Daily email: receive a daily summary of the companies in this view that visited your site. Revisit notifications: get a notification when a company in this view visits your site. Your notifications will apply to the currently selected filter. Click Saved filters to select an existing filter or click Add filter to create a new filter. In the upper right, click the Actions dropdown menu, then select Manage Notifications. In the dialog box, click to toggle the Daily Email and/or Revisit notifications switches on. If you're an Admin, you can also subscribe your team members to notifications by clicking the Team notifications tab. For each notification type, click the Subscribe team members dropdown menu and select your team members. 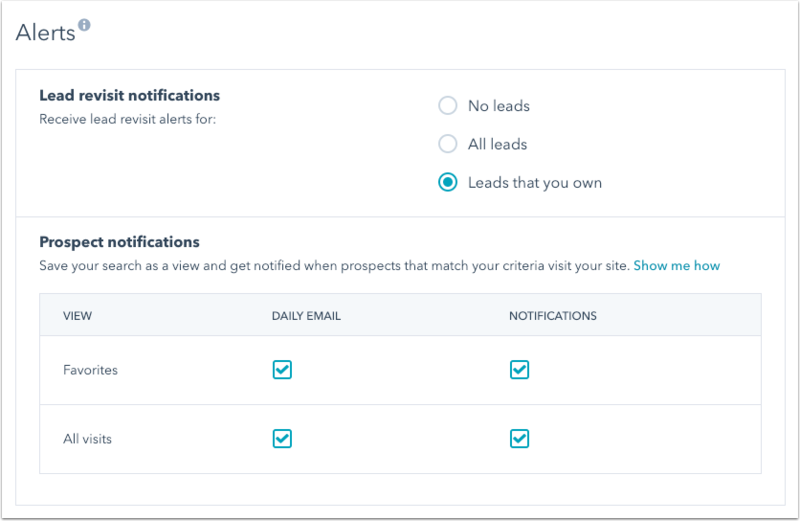 You can also manage your personal prospects notifications in Profile & Preferences. In your HubSpot account, click your account name in the top right corner, then click Profile & Preferences. 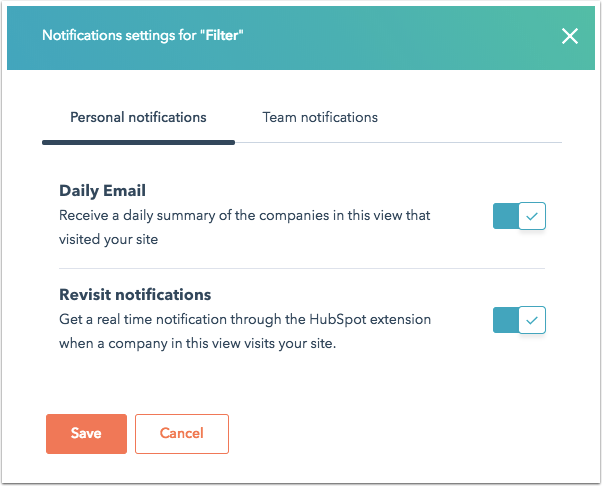 In the left sidebar menu, navigate to Notifications > HubSpot, then scroll to the Alerts section.